Fears have been raised by the German Government regarding the safety of Microsoft Internet Explorer. Concerns over IE's security have escalated to such an extreme that experts speculate it would be possible for criminals to control people's computers remotely and access private information such as passwords. This month the German Federal Office for Information Security have made a stand to protect potential victims, issuing a warning advising Internet users to find an alternative browser. Microsoft have conceded that IE was at fault for the recent attack of Google's systems but protest against claims of the continued risk for IE users. Microsoft recommends that users should increase their security settings to avoid serious risk. Doing this canconsequently block some safe websites, making for a difficult browsing experience. Ultimately, increasing security settings on IE is still not a water-tight guarentee to protect all users from attack. With Microsoft IE prevailing with such a monopoly, it is easy to forget the plethora of alternative browsers on the market; Fire fox, Google Chrome, Opera and Safari to name but a few. None of these are vulnerable to the security flaw cuasing such alarm to the German authorities. Most of our new clients are coming to us asking for websites with a CMS or Content Management System. Content Management Systems are great. They let you update the text, images and links on your website so you can keep your website updated yourself. Usually they work within a framework on a website, allowing the overall design of the website to remain the same around the updatable content. You get the best of both worlds, a fantastic looking website and control over your website content. However, not all content management systems are created equal. They all differ in complexity, offering various levels of control over your content. Some of them are free, and some you have to pay for. So what should you look for in a CMS? The CMS should be easy to use. You should not be daunted by endless jargon or complex menus. It should be web based to make it easy for you to update your website on the go. Search Engine FriendlyYour CMS must be built to be search engine friendly. It should let you control link title text, image title and alt text, page titles, page aliases and meta keywords and descriptions. A good CMS should come with great support. Rather than just being a free system bolted on to a website design that leaves you with an unmaintained support forum, you should be looking for passionate client support. Great support means being able to contact a UK based support team by phone and email, and being able to access in depth step by step guides. Frustrated with a complex content management system of their old website, some of our new clients were amazed when they first had a go at using the Toolkit, our content management system. It's easy to use, and gives you great control over the different areas of a website. It's been built to be search engine friendly, and should you ever get stuck, a friendly UK support team are only a phone call away. We even offer over the phone training using a remote access system to ensure our clients are confident using the Toolkit. 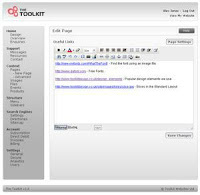 Come to Toolkit Websites, Web Design in Southampton, Hampshire, UK for a website with a content management system that can help your business grow.